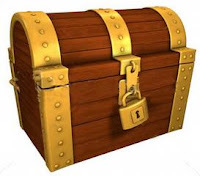 This is an example chest. When you find a chest, click it. You will get a message either saying "Try Again" or you will be lucky and get a message giving you a code for a 7-Day Pennyfarthing Rental and 1,000 Crowns. Be the first to redeem the code and win the prize! Starting Monday, July 22nd, I will be hiding 1 code each day for 5 days. There is a catch though. The first day there will be 15 chests hidden throughout the site. Each day I will be adding 3 more chests and moving some of the previous ones around. On the last day, there will be a total of 30 chests hidden throughout the site. To give more people a chance, I will be hiding the codes at different times each day. The dates and times can be found listed below. The times are all Eastern. You can follow my Twitter for updates as well.